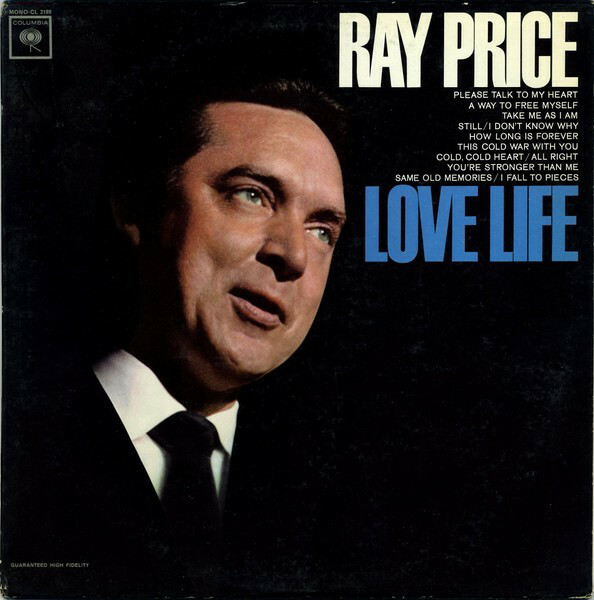 In this episode, we're featuring a Columbia concept album from "The Master" - Ray Price: "Love Life" (1964). Released after another highly successful thematic album in 1963's "Night Life", our feature album continues the tradition - this time, it's all songs about love. Loving, losing, heartbreak, euphoria, disappointment - the highs and lows of one of humankind's most relatable subjects - Price has a song for everyone's "Love Life" on this release, and he's fine voice to boot. Backed by some of the best Cherokee Cowboys that ever were - Johnny Bush on drums, Jimmy Day & Buddy Emmons alternating on steel and Tommy Jackson on fiddle - Price croons his way through this album without breaking a figurative sweat. Restrained yet soaring, his was one of the finest voices in country history and just why that was the case is demonstrated in abundance. Highlights include the Willie Nelson-penned "How Long Is Forever", the made-to-two-step-to "You're Stronger Than Me" and a tale of divorce in "All Right (I'll Sign The Papers)".. but as usual, there are no duds when it comes to mid-60s Ray Price.